The US Supreme Court handed President Barack Obama a major victory on Thursday by upholding tax subsidies crucial to his signature healthcare law, with Chief Justice John Roberts saying Congress clearly intended for them to be available in all 50 states. The court ruled on a 6-3 vote that the 2010 Affordable Care Act, widely known as Obamacare, did not restrict the subsidies to states that establish their own online healthcare exchanges. It marked the second time in three years that the high court ruled against a major challenge to the law brought by conservatives seeking to gut it. "Congress passed the Affordable Care Act to improve health insurance markets, not to destroy them," Roberts wrote in the court's decision, adding that nationwide availability of the credits is required to "avoid the type of calamitous result that Congress plainly meant to avoid." Roberts was joined by fellow conservative Justice Anthony Kennedy and the court's four liberal members in the majority. Shares of hospital operators, health services providers and insurers rallied broadly following the court's decision to uphold the subsidies. Top gainers included hospital companies Tenet Healthcare Corp, up 8.8 per cent, and Community Health Systems Inc, up 8.5 per cent. Roberts wrote that although the conservative challengers' arguments about the plain meaning of the statute were "strong," the "context and structure of the act compel us to depart from what would otherwise be the most natural reading of the pertinent statutory phrase." Justice Antonin Scalia took the relatively rare step of reading a summary of his dissenting opinion from the bench. In his reading of the statute, "it is hard to come up with a reason to use these words other than the purpose of limiting credits to state exchanges," Scalia said. "We really should start calling the law SCOTUScare," he added, referencing the court's earlier decision upholding the constitutionality of the law. SCOTUS is the acronym for the Supreme Court of the United States. Conservative Justices Clarence Thomas and Samuel Alito joined Scalia's dissent. The current system will remain in place, with subsidies available in all 50 states. If the challengers had won, at least 6.4 million people in at least 34 states would have lost the subsidies whose average value is $272 per month. "The subsidies upheld today help patients afford health insurance so they can see a doctor when they need one and not have to wait until a small health problem becomes a crisis," said Dr. Steven Stack, president of the American Medical Association. Rich Umbdenstock, head of the American Hospital Association, said the subsidies have allowed people to more easily seek care, calling the ruling "a significant victory." Leading up the high court's ruling, Obama warned of far-reaching consequences of overturning a law that he said had become "woven into the fabric of America." In a June 9 speech, Obama said taking away health insurance provided under the law to millions of people who need it the most "seems so cynical." Conservatives have fought Obamacare from its inception, calling it a government overreach and "socialized medicine." Opponents repeatedly but unsuccessfully sought to repeal it in Congress and launched a series of legal challenges. In 2012, Roberts, a conservative appointed by Republican President George W. Bush, cast the deciding vote in a 5-4 decision that upheld the law on constitutional grounds, siding with the court's four liberals. The plaintiffs said they were "deeply disappointed" with the ruling. The law "unfairly restricts the health insurance choices of millions of people, and it threatens their jobs as well," they added. A district court judge ruled for the government, as did the federal appeals court in Richmond, Virginia. But the Supreme Court then agreed to hear it. 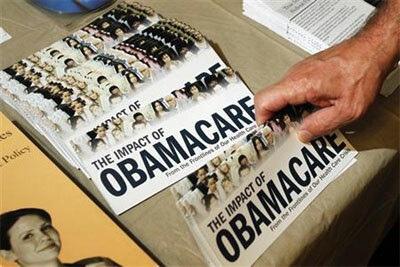 The Obama administration, backed by the healthcare industry, said other provisions in the law made clear that Congress intended the subsidies to be available nationwide regardless of whether states set up their own exchanges or leave the task to the federal government. The case is King v Burwell, US Supreme Court, No. 14-114.